Referees: Blaž Zupančič, Primož Pipan, Blaž Smrekar (SLO). Sluneta made first four points, next four scored by home player Ramo Rizvić. Both coaches have made some substitution but the score difference never changed. Every Šenčur player who came on the court scored at least two points. 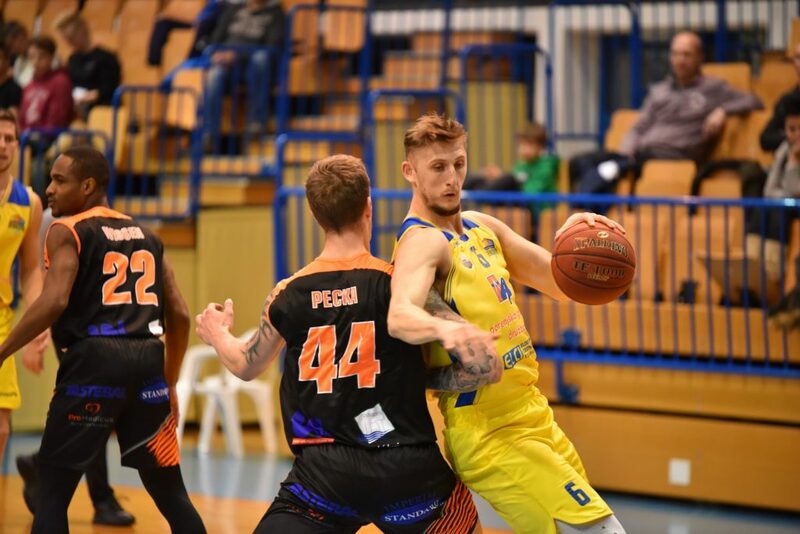 Šenčur had the biggest lead for seven points, by the end of the quarter the gap was still five points (23:18). In start of the second quarter Popadić scored a three pointer and another lay up for the biggest lead by Šenčur (32:20). Home team kept striking and the gap consistenly remain near by ten points. After three point made by Dino Murić Šenčur lead by 15 points (55:40) and differnce became bigger with slam dunk by Smiljan Pavič (57:40). Halftime was secure by home team (58:42). After technical foul in the third quarter, called for Spencer Svejcar, Šenčur already led by 18 (65:47). Martinčič scored his firs three pointer and the home team was way ahead (68:47). Few minutes later Marko Popadić made three pointer and Šenčur lead with the biggest gap 81:56.